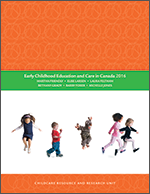 This report is intended to be a useful tool for policy makers striving to strengthen child care policy and programs, researchers studying child care, family and workplace policy issues, advocates working for accessible high quality child care for all Canadian families and employers of non-standard hours workers. Its main purpose is to provide an up-to-date report on the state of child care for families working non-standard hours in Canada. International examples of non-standard hours child care provision, research and analysis. Challenges, opportunities and issues for child care are identified and analyzed in the larger context of Canadian child care. In that context, the report includes practical information about what seems to “work” and what does not seem to work for families and services. The paper’s last section uses the information to make a number of recommendations to governments, employers, unions, human rights specialists and parents.